This is a chart of the daily views that Solomon gets on YouTube. Solomon is a young cinematographer based in Georgia, and his impressive, stylized videos are a YouTube sensation. He gets emailed by directors that want to work with him; men want to be him and women throw their underwear at him. He will get to work in his chosen profession until the end of days. When I first spoke with Solomon he was completely shocked by his success on YouTube. He told me that the response was so overwhelming at first that he didn't even get through all the email. Months later he discovered that the director of the Winnie the Pooh movie wanted to work with him (among other offers). When I asked him if he wanted to work on features his response really surprised me. He said that he wanted to work on short films to keep the quality of his output high and then build from there. This is a guy that, when Hollywood calls, doesn't even read the email. How'd he do it? As you can see from the graph, almost half of his views came from related video clicks. This means that the representative frame of his video was so compelling that 50,000 people clicked through to it. Pretty simple, right? Well, to get his video into a position that people could see it to click on it is a bit more complicated. The first factor that determines if your video will show up on people's radar is the title and the metatags associated with it. 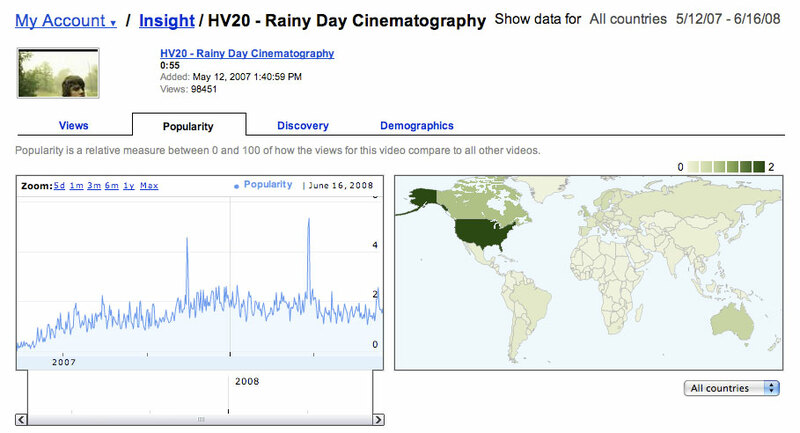 The title Solomon selected for this video was Rainy Day Cinematography which, while being an interesting title, is not something that relates to a large number of other videos. So his metatags must have really been the driver. If we dig into the metatags I think we'll strike gold. This list begs the question, were tens of thousands of bored teenagers looking for videos starring a guy named Sam? The answer is no. The key term in his metatag list was HV20. Solomon published this video right when the Canon HV20 hit the market. The HV20 was one of the first consumer HD cameras and at the time there was a huge amount of buzz and interest surrounding it. Solomon certainly helped himself out by choosing a hot keyword (for which there was not a lot of competing product). I decided to test out this theory by running an Adwords ad for the current model number, HV30, and sure enough after 2 days I am getting a 1% click-through rate (the click-through rate I get on less popular keywords is about half of that). Thus hot, niche keywords really do make a difference. I also tested out this theory by posting a similar video (though certainly not as technically adept) to YouTube. I put two copies on YouTube: one copy was posted with Solomon's keywords and one copy used more targeted keywords. The video with targeted keywords is doing much better than the video with Solomon's keywords. Which means that Solomon could have even more traffic if he simply dropped keywords like "Sam" and "art" and added keywords like "HV30" and "HDV". This is the kind of mass appeal that would make a Disney exec cry. He does as well with 0 year olds as he does with 45 year olds. This is a tribute to the technical excellence of his work. It's also highly entertaining and only 55 seconds long. What's not to love? The key lesson here is that quality does count on the web. 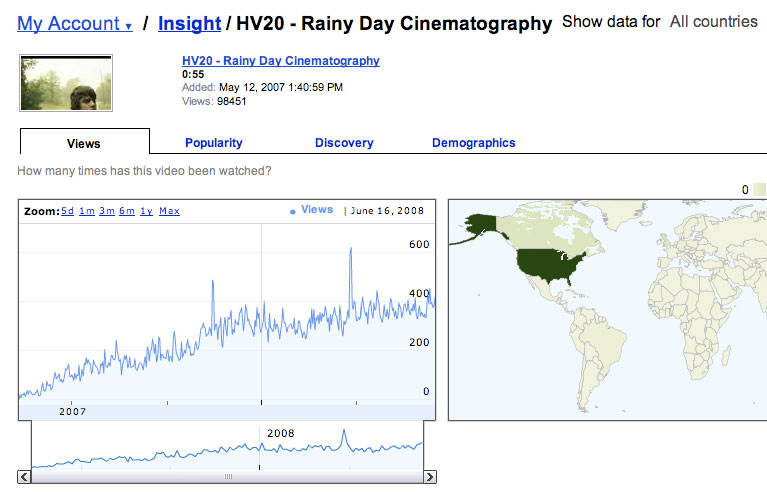 Was this clip's success entirely dependent on the timing of the HV20's release? The HV20 was certainly a factor, but it turns out that most of the serious content that Solomon posts is a hit. A 3:45 minute long music video that he put up in 2006 still has legs (at about 140,000 views). There must be some common factors across his videos. If you look at his channel you'll only see 122 subscribers, so it's not like he has a big fan base out there pushing his stuff once it hits the streets. His audience is mainly people that discovered his content through the YouTube interface and liked what they saw. 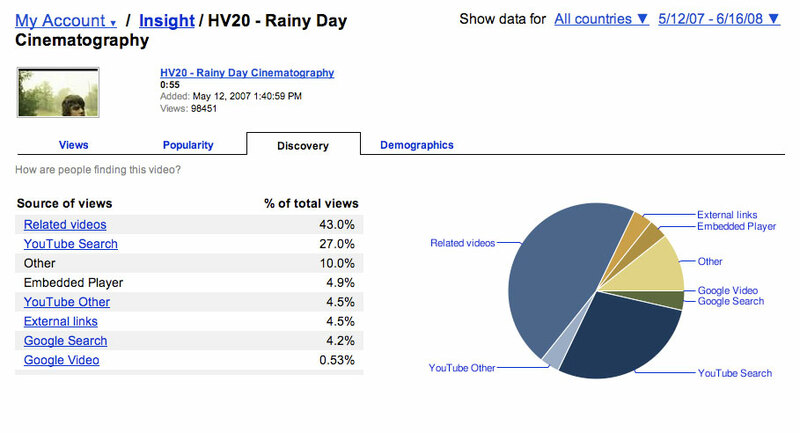 Rainy Day Cinematography currently has 336 favorable reviews while his music video has 443 fans. Those are great numbers. Now don't get me wrong. There are bigger hits out there. But most of the popular videos on YouTube have some kind of catch (usually involving cleavage) and you certainly cannot build a career out of them. Solomon is a died-in-the-wool, sincere filmmaker that is simply practicing his craft. He looks to have a promising future because of his talent and the exposure that YouTube offered him. Now if he would only answer his email.